The title of this post might well seem backwards at first. Discordant, even. It should read "giving and receiving," shouldn't it? It's a good time of year to think of gifts and gratitude. Naturally, these concepts tie in to celebration, to life and to joy. Only, they so often don't. The holidays can quickly become burdensome, as our old, very natural sense of wonder is buried under a clogging mire of obligations and to-do lists. Good cheer gives way to less desirable emotions. There's a simple problem here, but this problem has deep roots. Our order is reversed. This may seem like a small thing, but it is not. The presentation of evidence absolutely must come before a verdict. When the verdict is established first, we no longer have anything resembling due process. Fairness is turned on its head. Timing matters. The order of thoughts and events matter. The idea of "giving and receiving" is deeply ingrained in our culture and psyches. That phrase exists as it does for a reason, and twisting it around 180-degrees can be rather jarring at first. Whether we care for the idea or not, we are all the heirs of a Protestant-influenced culture. Not all of this is detrimental, by any means. Our passion for individual growth, commitment to social justice, and valuing of merit over birth owe a great deal to Protestant philosophies. However, the words we use--the very way ways in which we think--are saturated with certain presumptions. It is up to us to bring these core assumptions forward for examination and to chose or reject them on a more conscious level. In law, even a strong presumption may be open to rebuttal. Culturally as well as linguistically, giving comes before receiving. We are to work for what we receive. It is the rare employer indeed who pays employees in advance, before they have put in their time. Some of the more predominant forms of monotheism emphasize having faith before anything is proven. You absolutely must commit to the verdict before the evidence is offered, otherwise you are in breach of the terms mandated by that religious community. Other forms of monotheism might be less strict about this, but there is often an underlying sense that one should do certain things now to reap rewards later. You shall give, that you may receive. Nature does not work this way. Not at all. Think of breathing, of the exhaling as giving. The plants will certainly make use of your offering of carbon. So, go ahead: try to exhale first. Try to give before receiving. It can't be done. We quickly see how the inhale has to come first. Likewise, the trees cannot glow with the sun's rays, nor transform carbon into oxygen, without first receiving. Soil, water, and light: the trees must have gifts in order to give gifts. And they must have these things more or less constantly, in a flow of exchanges. No thoughtful person expects a tree to keep giving of itself if it receives no sunlight. Likewise, no tree can thrive if torn out by its roots. At best, it may survive--but it will need new soil quickly, and there are no guarantees it will do particularly well after such a violent transfer. The sad irony is that we sometimes tend to expect ourselves (or others) to keep right on giving where we might show more compassion for the tree. It is no mistake that breath is the first gift and that it is given by Odin Himself--the Veratyr, the very God of Being. Receive to give. Receive to give, and then receive to give again. This flow, this dance never ceases. Only dead things seem static, and even that's an illusion. As you receive, so do you give. 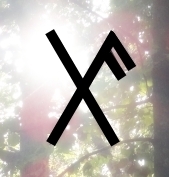 Gebo and Ansuz: A Traditional Bindrune for "Gift of the Gods" or "Gift for the Gods"